Is your magic show boring or not funny? Want to add a fantastic, a laugh a minute, complete routine to your show? Well there's great news for you! David was taught the basis for this real funny routine by his Grandfather, Leon M Leon. David Leon is the fourth generation of Magic Leon's. His Great grandfather is the Great Leon of Vaudeville fame. David has been performing this routine for many years and has been talked into releasing it to the magic community! What is Scents of Smell? Well it isn't your every day "pick a card and find it routine". You'll find their card by smelling it! That's right, it's true and it is easy to do. So easy you can even do it blindfolded! There are many surprises and lots of laughs. David uses an old, under estimated principle and works in a real funny routine. What comes with Scents of Smell? You will get everything you need for a complete 10 minute routine (or longer if they can't stop laughing). You will get all the props you'll need; large custom made 6x9 cards with envelopes (suitable for stage, parlor and parties), rubber gloves, blindfold, tongs, tissues, breath stick, and instructional DVD with routine outline. All of which comes in a lockable aluminum case. But wait, there's more! David is throwing in, for FREE, a custom made walk around size so you can do Scents of Smell in close up situations! 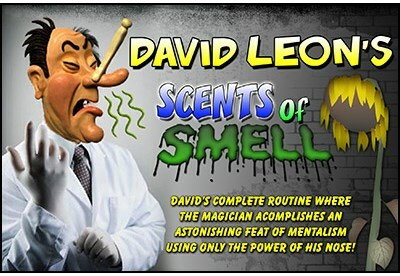 Warning: Performing David Leon's Scents of Smell may cause serious side aches from laughing too much. Other side effects may include, the urge to smell everyone around you, warring rubber gloves for no apparent reason, and getting invited back to do more shows. Please be careful and smell responsibly.